Note: Before I get started, just a reminder that this review will contain spoilers for Infinity Wars #1. So if you’d like a quick rundown of everything that has happened in the story so far, you should go here first. So when we last saw Gamora, she had just outed herself as being Requiem, revealed that she had killed her father Thanos, declared her intention to enter the Soul World no matter the cost and then proceeded to impale Star-Lord upon her Power Gem enhanced blade. All said, she’s had quite a busy morning. Elsewhere Loki and his travelling companion/librarian Flowa are on a quest to discover why Loki remembers events differently from how they appear to have actually happened. Being a god of mischief he naturally assumes that this is some sort of trick, though who’s behind it and why have so far eluded him. Action is always a difficult concept to convey when you’re working with still images, but some of the panels capture a real sense of weight and force of impact throughout the fight that spans practically the entire issue. The artwork, once again provided by Deodato and Martin, has some wonderful moments of visual storytelling that I’d really like to see more of in comics, where all too often, characters clearly spell out exactly what they’re thinking, feeling or doing, which makes for concise but ham-fisted narrative delivery. Thanos, dead or alive, will always loom large in Gamora’s life. While there isn’t much in the way of direct narrative exposition this issue, Duggan does raise a couple of new questions about Gamora’s mental state and motivations, hinting at a possible hidden hand that is manipulating her and shaping events to their (or perhaps its) own ends. Unfortunately, and somewhat frustratingly, we don’t learn anything more about Loki’s side of the story at all in this issue, although the ending does promise that this will be addressed in the next installment. 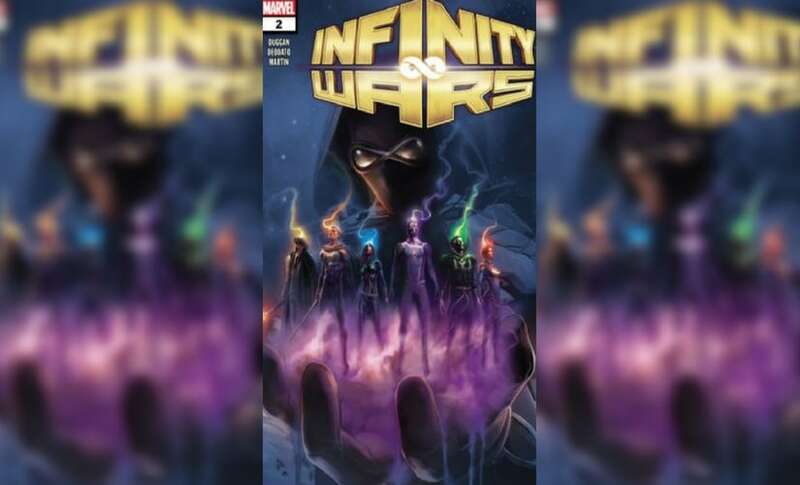 Infinity Wars #2 is not a bad comic by any means, but having such an action-heavy issue before the stakes and possible consequences for the outcome of this battle are clear is a bit of a disappointment. 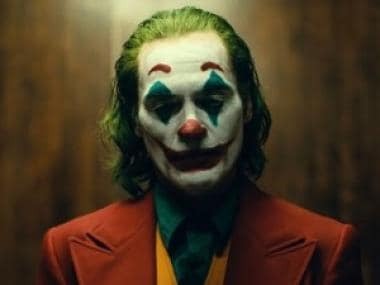 Despite providing hints of what could be some really great plot points down the line, in the end, it doesn’t quite deliver as much actual plot progression as I’d have liked. That said, I’m still hopeful that Duggan has a satisfying pay off for everything he’s spent so many months building up to and that Infinity Wars #3 will provide us with a good chunk of narrative that we can sink our teeth into as we move into the 2nd act. If you don’t like spoilers, congratulations on making it to the end of this review! But if you don’t mind having the whole issue spoiled for you... well then keep scrolling because we’re just getting started. Great, you’re here. Now, where was I? As I mentioned earlier, this issue kicks off with a flashback where Thanos instructs a young Gamora on his view of the universe. That life is a constant test and that no one is invulnerable, not even him. According to him, true immortality is only attainable through one’s children, whose lives you shape in the hope that they will carry on your legacy. 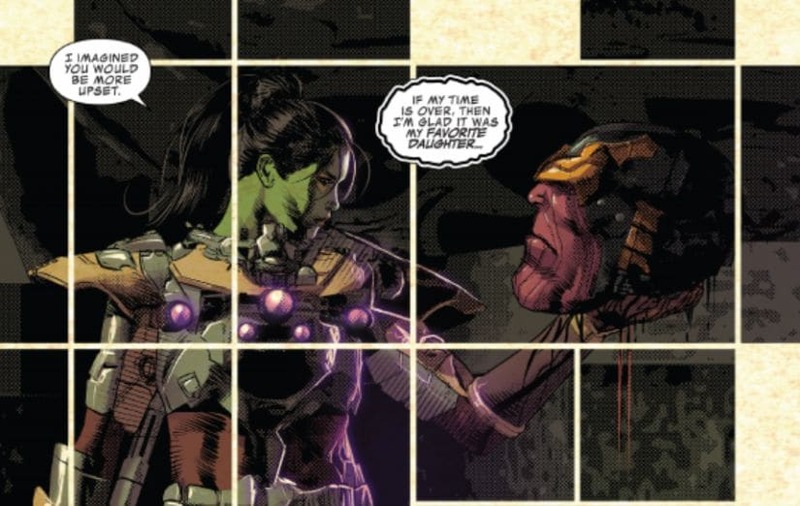 This exchange appears to foreshadow coming events as Gamora, willingly or not, seems to be walking down a path to coveting the Infinity Gems in a manner similar to her late father. 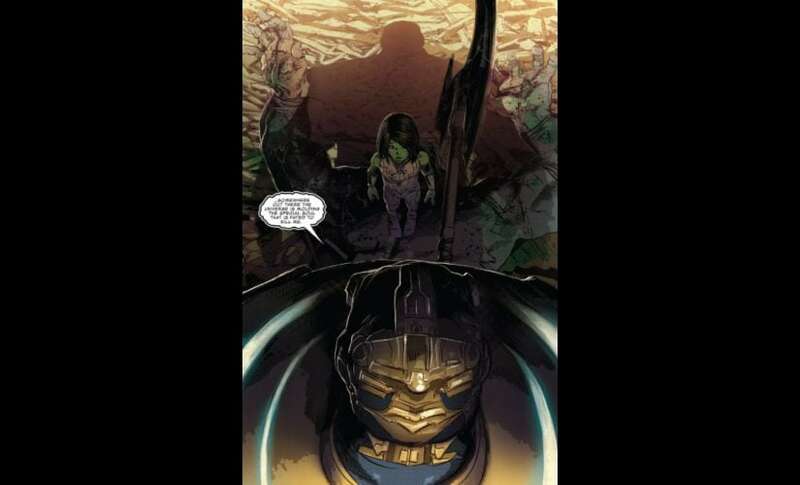 One of the oddest things about this story is that Thanos, even after being struck down by Gamora, appears to be able to communicate with his daughter, seemingly encouraging her to secure the gems for herself. At first, it seems to be an inner monologue or a hallucination brought on by Gamora’s compromised mental state. But as the story progresses, it seems that there is something far stranger at play. Whether it’s a result of mental conditioning or something to do with the vulnerable state of her soul, it would seem that the Mad Titan has found a way to truly live on within his favourite daughter. Speaking to the dead isn’t unheard of, but getting regular replies is rarely a good sign. Coming back to the fight that kicked off at the end of issue #1, Doctor Strange uses the time stone to undo Peter Quill’s untimely demise, much as I predicted he would in my previous review. Strange also uses the opportunity created by stopping time, to get a private word with Turk Barett and make him an offer to give up the Mind Gem before it’s taken from him. Turk accepts on condition that Strange owes him a favour, a request that Strange readily agrees too, since, as he dryly points out the odds of both of them surviving what he fears is yet to come aren’t that good anyway. Back in Central Park, the minor villains that escorted Turk are spurred into full retreat as a barked order from Captain America telling them to clear off sends them running without a fight. For me, this was a welcome decision since Turk Barrett and his little group of what I am very generously calling two-bit villains simply don’t deserve a place at the table when it comes to events of this magnitude. The fact that the entire group didn’t meet a quick, messy and ignoble end at the hands of Gamora clearly demonstrates that Duggan is a more merciful storyteller than I will ever be. 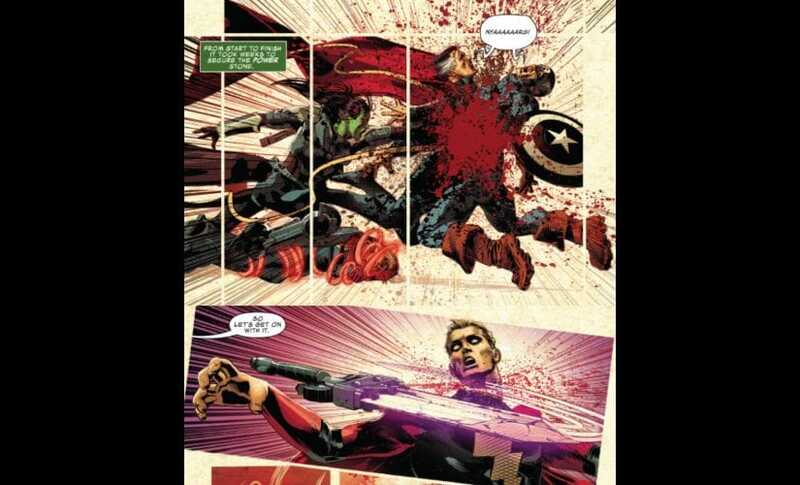 Cap and Strange, however, appear to have suffered something more painful than death. Until now Gamora’s only objective that we were aware of involved getting her hands on the Soul Gem, but during this fight, we find that she appears to have been trying to get her hands on all the gems right from the start. This would seem to hint that she’s walking in her old man’s massive footsteps and has larger personal ambitions regarding the Gems. Alternatively, it’s equally possible that she plans to use the Gems to fulfill a more altruistic plan that we are not yet aware of. Or perhaps she really was just after the Soul Gem all along and claiming the other gems for herself was simply a convenient and powerful means to an end, but I doubt that’s the case. 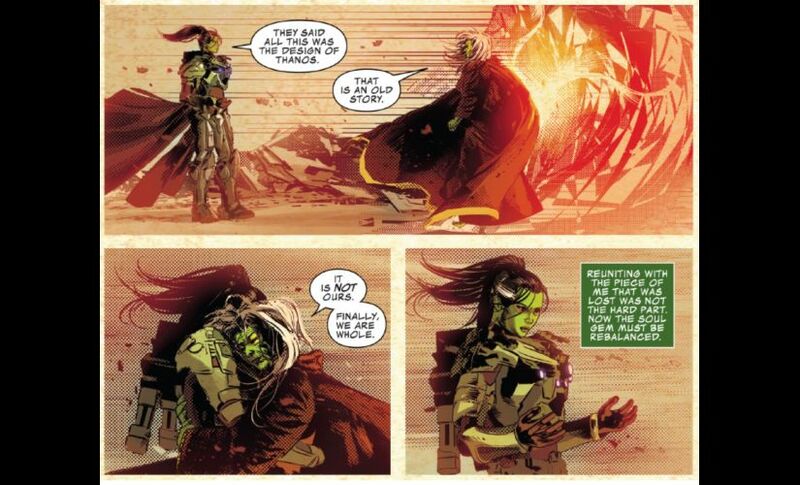 Regardless of intentions, a short, decisive fight later, Gamora does enter the Soul World, seemingly finding and merging with the part of her that remained there in limbo. I believe that’s why she is aware of Devondra and the need to rebalance the Soul World, despite her never mentioning such a plan at all up to that point. It’s not yet clear what new information this merging of souls has brought to light. But Gamora is well known for playing things close to the chest, so it’s pretty hard to determine what she currently knows and how long she has known it. She speaks of a need to feed Devondra and since I get the feeling that Devondra is a, if not the, soul eater, it’s likely going to take a lot of souls to sate that appetite. 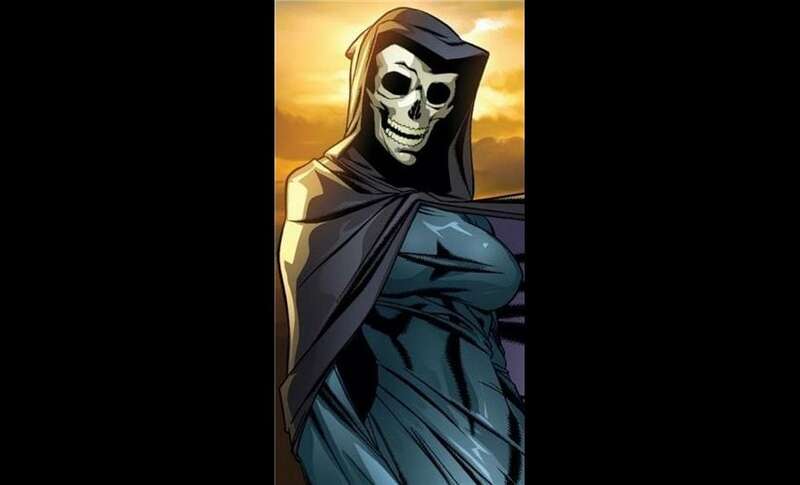 Mistress Death. Thanos has... eclectic tastes when it comes to romantic partners. All in all, this issue has been a weird one and it ends on the strangest note of all. While Gamora stands in the Soul World, contemplating what comes next, she’s confronted by Loki, who claims he can offer a better alternative to whatever plan she may be formulating. But to find out what that alternative is, as well as how Loki and Flowa seemingly got into the Soul World without the Gem being involved... well, we’re going to have to wait at least until issue #3 to find out.